Yacht and Sailing Clubs are typically places where collections of sailing vessels of varying sizes and technicalities are maintained. This is to enable people, be it casual sailors or professional ones to take their interest forward in exchange for a certain membership fee. The areas which need to be monitored for efficient performance management include - Operations' Architecture Perspective, Sailing and Training Evaluation Perspective, Offerings' Assessment Perspective and Customers Safety Perspective. The metrics for Operations' Architecture Perspective are- Number of Reciprocal Clubs, Social Activities List, Number of Facilities and Equipments' Stock Grading. Sailing and Training Evaluation Perspective can be assessed with KPIs such as 'Number of months for which sailing is done', 'Average Fleet Size', 'Training Staff', 'Repairing and maintenance assessment' and 'Sailing Area'. KPIs for analyzing the Offerings can be done using parameters like 'Number of schemes run', 'Number of Lessons provided', 'Number of regattas in sailing season' and 'Duration of Annual regatta'. Lastly, the Customers Safety Perspective can be calculated with indicators such as 'Customers' Feedback', 'Crew Efficiency', 'Investment in safety Solutions' and 'Drop in the mis-happenings'. Average fleet size and total number of members will give more or less precise picture on yacht club growth. Number of facilities and events can characterize the club's initiatives to attract more clients. Number of professionals among yacht club members can also demonstrate its popularity, and thus, it should be evaluated. Download trial version of Yacht and Sailing Club Dashboard. Purchase full version of Yacht and Sailing Club Dashboard + bonus. Clubs engaged in offering Yacht and sailing services are expected to conduct the task efficiently and accurately. One of the areas that deserve maximum attention is that of 'ensuring safety' of sailors. Such places are highly prone to accidents and mis-happenings therefore should be tested for their efficiency. This in turn, will require knowing about the way employees carry out their jobs. To do justice to all the areas involved in handing operations at sailing clubs, a measurable approach is a must. This can be in the form of BSC (Balanced Scorecard) that is studded with useful and related set of metrics to enable the 'statistical approach'. Yacht clubs are also places where events like sailing races are organized for in addition to making a 'community meeting spot'. To take care of all the areas that are involved in a yacht club, a relevant set of parameters, called KPIs (Key Performance Indicators) can be put together. This will make it possible to measure the steps and procedures of any given field, it being a sailing and yachting club in this case. Related metrics and KPIs for: Ski Resort, Tennis Club, Sport Gym, Golf Club, Swimming Pool. Customers who viewed this item also viewed: Inventory and Warehousing. This is the actual scorecard with Yacht and Sailing Club Dashboard and performance indicators. 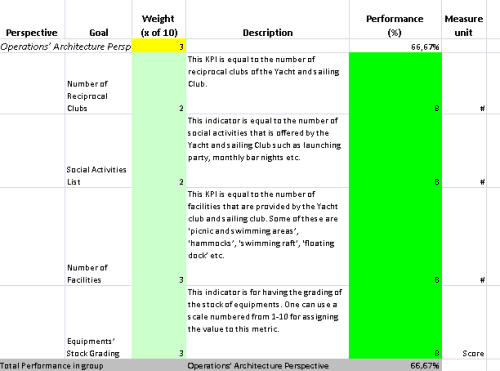 The performance indicators include: operationsâ€™ architecture perspective, number of reciprocal clubs, social activities list, number of facilities, equipmentsâ€™ stock grading, sailing and training evaluation perspective, number of months for which sailing is done, average fleet size, training staff, repairing and maintenance assessment, sailing area, offeringsâ€™ assessment perspective, number of schemes run, number of lessons provided, customization level, number of regattas in sailing season, duration of annual regatta, customers safety perspective, customersâ€™ feedback, crew efficiency, investment in safety solutions, drop in the mis-happenings. Download a trial version of Yacht and Sailing Club Evaluation Balanced Scorecard or purchase a full version online.